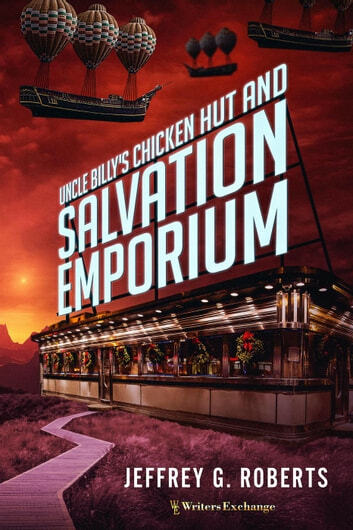 Welcome to Uncle Billy's Chicken Hut & Salvation Emporium. Just who is Uncle Billy--the 6'6", 300-pound Texan that resembles a psychedelic St. Nick--and who or what conferred upon him the God-like ability to ease the passing of muddled souls? Angel, demon, or former bouncer at O'Reilly's Chinese Cantina & Pub? Who knows? Who cares? Suffice it to say that Uncle Billy and his menagerie of helpers have been here for centuries. The only thing that could threaten his very important job of transitioning the dearly departed to the appropriate afterlife are interdimensional pests called punstafulz...and they've infested the Emporium, excuse the pun, like there's no tomorrow. Getting rid of them will take some doing for Uncle Billy and the gang, but, hey, in the meantime, come on in and set a spell. It's not like you're going anywhere, right?